Bonn, 13 December 2017 - The AEWA Northern Bald Ibis International Working Group (NBI IWG) comprises the eight principal Range States of the two populations of Northern Bald Ibis. Five of them came together for the 2nd meeting of the NBI IWG in Agadir, Morocco from 25 to 27 September 2017. This meeting followed the first gathering of the Group in November 2012 in Jizan, Saudi Arabia where the revision of the International Single Species Action Plan for this critically endangered species was launched, which was later adopted at MOP6 in 2015. The main focus of the meeting was the translation of the International Single Species Action Plan into a detailed implementation plan for the next three years up to 2020 when the Range States are planning to meet for a third time. For this purpose, the delegates from the five attending Range States and observer organizations worked in three facilitated break-out groups. The resulting list of prioritized and time-bound activities with clearly attributed responsibilities will ensure gradual progress towards the achievement of the objectives and results set out in the international action plan. The NBI IWG also revised its Terms of Reference in line with the 2015-adopted revised International Single Species Action Plan and discussed funding opportunities to resource the implementation plan as well as revisiting its reporting practices; the chairmanship passed from Saudi Arabia to Morocco for the next intersessional period up to the Group’s third meeting. 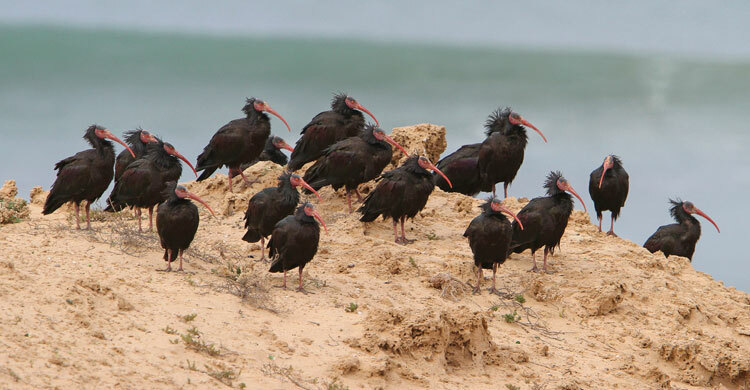 On the last day the meeting, participants visited the Sous-Massa National Park, where they observed a feeding flock of more than 70 Northern Bald Ibises and examined one of the breeding locations on cliffs over the Atlantic Ocean. The meeting was generously hosted by the High Commission for Water and Forests and the Fight against Desertification and organized by the Souss-Massa National Park administration. Co-funding was provided by the Royal Society for the Protection of Birds. For further information please contact the NBI IWG coordinator Chris Bowden or the AEWA Head of Science, Implementation and Compliance Sergey Dereliev.